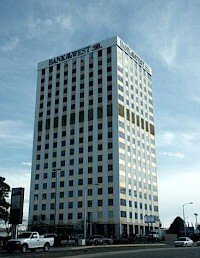 Bank of the West Tower is a highrise office building located in Albuquerque, New Mexico at 5301 Central Avenue NE. At 65 m (213 ft), the 17-story tower was the tallest in the city as well as the state when it was built in 1963. Its location, several miles from downtown at the intersection of Central and San Mateo, reflects the 1960s exodus of businesses from the city center. The Simms Building in downtown Albuquerque, New Mexico was the city's first modern, International Style skyscraper. 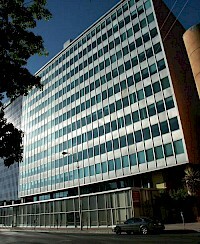 It was built in 1954, making it a contemporary of the similar Lever House in New York City. The building is located at 400 Gold Avenue SW, which was originally the location of the old sandstone Commercial Club building.